One of the last things one might expect after a career reading and writing about law enforcement is spending lots of time discussing the perceived beef between police officers, police unions, and pop star Beyonce Knowles. But it is what it is, as they say. The “Cops vs. Beyonce” show is now rolling into Pittsburgh. The police chief says there will be no staffing issues that will impact event security, despite animosity towards the singer in some quarters of the law enforcement community. But the police union president says that’s not the case. Actually, everyone’s a little foggy on the details. “I don’t know who’s working it (the traffic overtime assignments). It’s my understanding they’re going to mandate that the officers work it,” said Robert Swartzwelder, president of the FOP local. “… a listing of ‘secondary employment details’—overtime police work opportunities—seeks a total of 18 officers to work at the Beyonce concert inside Heinz Field but shows only 13 had signed up to do so as of Monday afternoon. That’s 72 percent of the targeted figure. Maybe more officers have signed up for the detail. Maybe they’ll be a few bodies short. 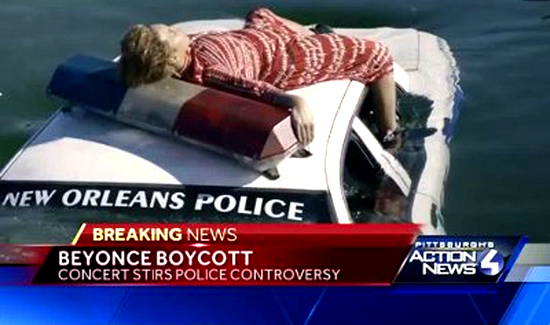 However it shakes out, one thing’s for absolute certain: the papers and the internet love this “Police vs Beyonce” stuff.